Jenn and Romy: A Great Horned Owl Visited! A Great Horned Owl Visited! The Great Horned Owl in the pine tree. This morning, while we were having coffee before work, a Great Horned Owl visited our place. It came very quietly, because I was sitting right by the window and I didn't even notice. But eventually, I knew something different was going on outside because the blue jays started screaming and they wouldn't stop! They were screaming in the pine tree right in front of our house, next to the window we were sitting by, so I started looking around. I was so shocked when I saw that the blue jays were actually trying to dive bomb a huge owl that was calmly just sitting on one of the branches in the tree! 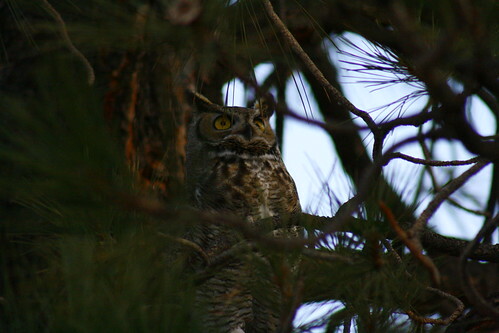 Another close up of the owl in the pine tree. We watched it perch there and try to ignore the 4 blue jays that were taking turns flying into the poor owl's head! It was under attack! The owl noticed we were watching it and it started watching us too. Then it shifted to another branch once it noticed the quail that came out from the sage bushes (they come out each morning to peck at seed we throw out in front of the bushes). The quail apparently are not afraid of the owl. The quail are very good at spotting predators from very far away, so I'm sure they knew the owl was there. For example, there is a baby hawk that sometimes visits, and tries to hunt the quail. It sometimes perches on a dead tree in the neighbor's yard, which is kind of far away, but they can recognize it's silhouette, and they don't come out when the hawk is watching. But, sometimes the quail also rely on the blue jays to call out when there is a predator around (which they are experts at), but they didn't care about the jays creaming at the owl, I guess. I think the owl must not eat quail. The owl is looking up at the pesky blue jays. Romy had to start the truck to warm up before he left for work, so he had to go out the front door, which is under the canopy of the pine tree that the owl was sitting in. We thought that maybe Romy would scare the owl, but the owl just watched him walk out the front door, start the truck, and then point the camera and take a few pictures before going back in! We watched the owl for a few more minutes from inside, but eventually it had enough of the blue jays' attack, and it flew away! Interestingly, we saw it during the day (although it was right after sunrise), which means it was probably just finished with it's early morning hunt. 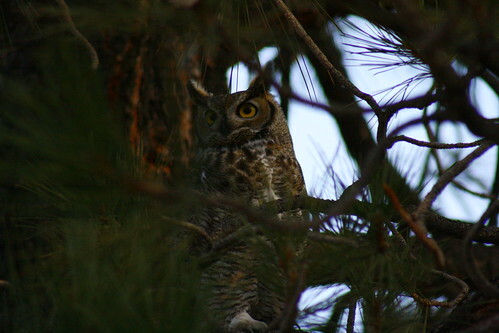 This is not the first time that a Great Horned Owl has come by here. We heard them hoot-ing almost every night in the summer and fall. One time, while I was hammering shingles onto the roof of the carport, a Great Horned Owl landed on the electric pole about 10 feet away from me. I didn't notice as I was hammering away (and I guess the owl didn't care I was hammering), until it started hooting. I was trying to finish up the last few shingles, so I stayed up there until past sunset, and it was starting to get dark, and thats when I saw it on the pole! Another one was across the street on another pole, and they were hooting to each other. I read that they do that to notify each other that they are about to take the area as their hunting territory. I watched the owl for about 5 minutes, and it was sitting watching me too. But then the sighting ended when the owls had a show down hooting at each other and the one by me flew off at the other one.